MARSH (March), JOHN, HBC governor in Hudson Bay; d. 1688/89. 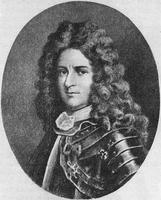 Recommended by Lord Churchill (later Duke of Marlborough), Marsh was appointed governor of James Bay in 1688 when the Company’s three forts had been for two years in French hands. He was instructed to build a new settlement on Albany River to re-establish the HBC’s trade but in doing so to avoid “annoyeing” the French, for a truce was in effect between the two nations. For the new fort Marsh chose an island in James Bay and began building operations. The ships Churchill (Capt. William Bond) and Yonge (Capt. John Simpson) were to winter with him and assist him. He was to take strong measures against private trading and interloping (trespassing on the Company’s monopoly). On the way out his party did meet an interloping ship, the Mary, which had become jammed in the Hudson Strait ice and they took its captain and 20 men on board before the ship sank next day. The expedition was ill-fated. While out hunting, Bond and his colleagues became careless of their safety and were surprised and taken prisoner by the French. Marsh, who was ill at the time, died on 30 Jan. 1688/89 (HBC Arch. A.15/3, L158). He was succeeded by Capt. Andrew Hamilton, his deputy, who shortly afterwards surrendered to the French, under Pierre Le Moyne* d’Iberville. Marsh left a widow, Elizabeth, who received settlement of his account in May 1690. Maud M. Hutcheson, “MARSH, JOHN,” in Dictionary of Canadian Biography, vol. 1, University of Toronto/Université Laval, 2003–, accessed April 24, 2019, http://www.biographi.ca/en/bio/marsh_john_1E.html.